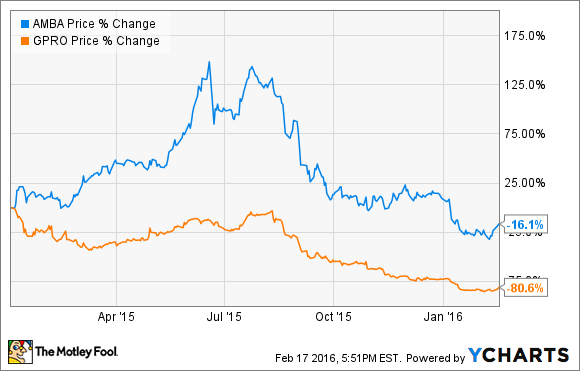 What Do GoPro Earnings Mean for Ambarella This Time? Is Ambarella in trouble once again after the action camera maker's latest difficulties? When the first cracks in GoPro's (NASDAQ:GPRO) armor began to show late last year, it wasn't entirely surprising when the company's primary video processing chip supplier, Ambarella (NASDAQ:AMBA), suffered as well. Though Ambarella stock initially skyrocketed through the first half of 2015 on the heels of GoPro's then-spectacular results, shares have more than given up those gains since, hurt as Ambarella twice blamed its own disappointing quarterly guidance on weakness in the wearable camera segment that GoPro dominates. Worse yet, two weeks ago GoPro not only revealed sales during its crucial holiday quarter plummeted more than 30% year over year but also provided disappointing guidance for first-quarter 2016 revenue to decline more than 50% at the midpoint of its range. That raises the question: With Ambarella's next quarterly report slated for March 3, does this mean investors will be forced to endure another disappointing outlook from the video chip company? The short answer: not necessarily. But GoPro's weakness certainly won't help. After all, up until recently, GoPro accounted for as much as 30% of Ambarella's total sales. But even as Ambarella continues to diversify its revenue by finding homes for its chips in other markets -- from automotive to IP security and flying cameras -- GoPro is still expected to comprise as much as 25% of the company's revenue in the coming fiscal year. What's more, keep in mind that GoPro's expectation for a steep decline in revenue is partially a function of its decision to narrow its capture device offering to just three products, including the HERO4 Black, HERO4 Silver and HERO4 Session models, eliminating its lower-end HERO models in the process. To be fair, the HERO4 Black and Silver together have made up more than half of GoPro's sales on both a unit and revenue basis since their release in late 2014, so it remains to be seen just how much removing those lower-end devices from the equation will negatively affect Ambarella. Ambarella investors should also keep in mind that their company has served as more of a leading indicator for GoPro's performance than the other way around. Last September, for example, the market took Ambarella's surprisingly light fiscal Q3 guidance as a harbinger of bad things to come for GoPro -- even though Ambarella management seemed to indicate that the weakness in wearable camera chips was largely a function of earlier-than-usual product launches from companies like GoPro and newer market entrant Xaiomi. If anything, it seems safer to assume if Ambarella management does reference the wearable camera segment in a negative light, it will instead mean extended pain for GoPro shareholders going forward. That's not to say there aren't other wild cards that could influence Ambarella's results one way or the other. According to a report last week from OTR Capital, Qualcomm (NASDAQ:QCOM) has recently ramped up its efforts to try to persuade both GoPro and Chinese drone maker DJI to incorporate its latest Snapdragon flight platform in their newest respective drone offerings. GoPro, in particular, has teased a differentiated drone solution for when it releases its Karma quadcopter sometime in the first half of this year. But while the threat of Qualcomm isn't exactly new, it's also no mystery that GoPro is striving to return to sustained, profitable growth going forward. And saving money with a lower-cost chip from Qualcomm could be an ideal way to do so if it doesn't come with deal-breaking performance sacrifices. In addition, even if Ambarella does manage to edge out Qualcomm for the sake of maintaining revenue, it could come at the cost of margins if it was required to lower prices to keep GoPro on its roster. Either way, this could be a huge blow to Ambarella's growth, as drones already made up around 10% of total revenue as of the second quarter of last year -- and this after Ambarella made waves at the Consumer Electronics Show last month by releasing an ambitious new HD system-on-a-chip catered specifically toward capturing the drone market. But that threat may not materialize until later in the year. In the meantime, it seems safe to assume Ambarella management will be fielding plenty of questions about its core wearable camera segment when it officially releases fiscal fourth-quarter 2016 results next month. Though the exact severity of its impact remains to be seen, I won't be surprised if Ambarella shares are once again held back as GoPro attempts to regain its former glory.